Outside of the office is the warehouse. It’s an immense space, occupied by different projects throughout. Everyone is measuring, drilling, and sanding, and there’s the fresh smell of wood being cut. Victor bought this building in Kensington at 1805 North Howard Street 17 years ago. Before that, Rossi Brothers started out in 1956 as a little shop on the 500 block of Fitzwater Street. Victor’s father studied design after the war, and was trained as a finish carpenter. He specialized in built-in work, just like Victor does today, and went into business with his brother Anthony, a cabinetmaker. 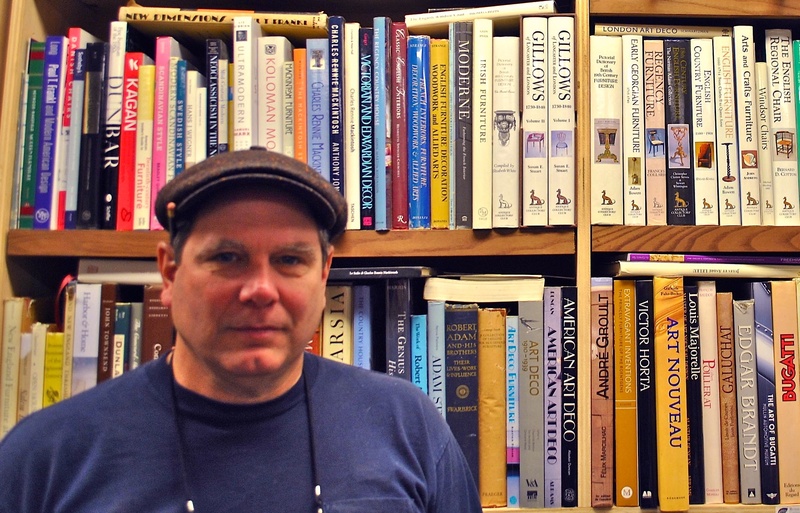 Victor is a Philadelphia native, and is well-acquainted with his city’s history. He has seen a lot of things change, but his business has kept its traditions. Despite the increasing role of computerized design in the field of cabinetmaking, Victor’s style of work is still very much hands-on. He is known for being thorough and careful. He is a craftsman who never trades expediency for meticulousness, and never rushes his work. Through this steadfast approach, he aims for perfect execution of each project that comes his way. How does your business approach furniture design? We build here the same way I was taught by my father, using handed down, time-tested, traditional methods. For example, we don’t use any computerized machinery. The drawings are done by hand, the carvings are done by hand, and we measure space ourselves. 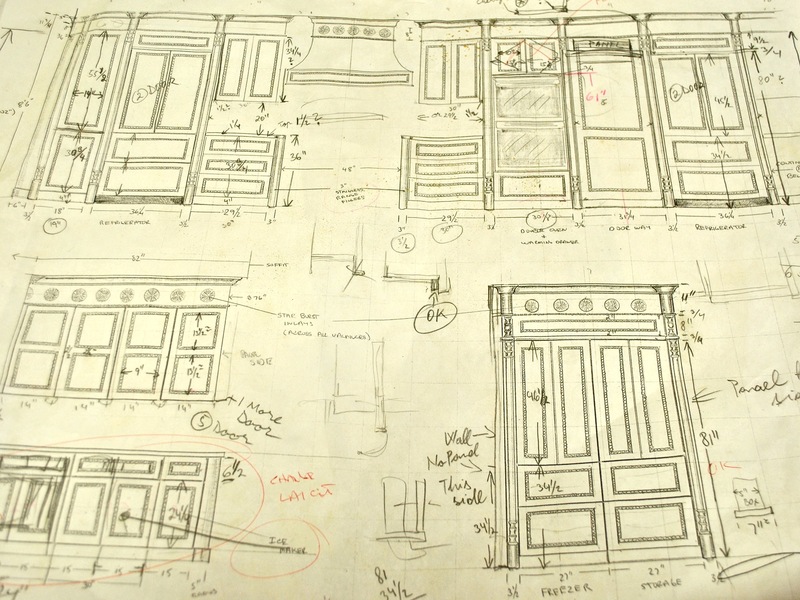 We still make everything here—moldings, boxes, drawers, doors. We don’t buy parts, even though that seems to be what most businesses are doing these days. That’s not the way I was taught, and I don’t like to cut corners like that. If someone wants a door, I don’t call up and find out where to order it. I take the time to make it. Does working mostly by hand produce a better quality product? When you’re working on something by hand and putting it together manually, you’re paying attention to the details. You’re figuring out the function of each piece like a puzzle, and your mind is active. A machine compensates for itself, and takes the thinking out of the process. Following instructions from a printed piece of paper will tell you where everything goes, and you don’t really have to pay attention to what you’re doing. It’s like when you start using a calculator, you get lazy. I’ve found times when I was a little tired, and I started using the calculator for the simplest problems. As long as the mind’s active, especially for a skilled cabinetmaker, the job will be a better job in the end. Some people don’t understand the difference between a product that was made by hand, and a product made with help of a machine. They look the same to them. Machines miss the sharp, crisp details only capable with human hands. 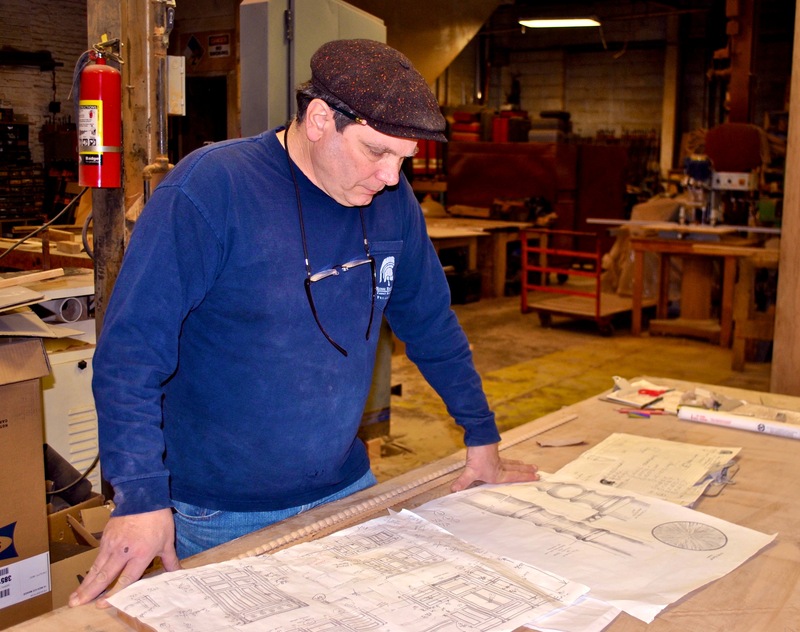 Can you recall the first moment you realized your passion for woodwork? I can remember that. After I graduated high school in ‘71, jobs were few and far between. But I knew I wanted to work with my hands, so I came home to work with my father as an apprentice. I had never had any drafting experience or went to trade school, but the first time I saw a set of prints rolled out before me, I understood them, and I knew I could read them. I don’t know why that was, but after studying these drawings I easily figured them out. I remember we once did a big built-in project, maybe 14 feet long or so, and I just liked the feeling of standing back and seeing something bigger than myself that I had built. At that point, I knew I wasn’t going to stay an apprentice, and that I was going to become a cabinetmaker. When I saw this project go from paper to 3D, when I saw it all come together, I knew that that’s what I wanted to do. From that point on I excelled, and learned fast. 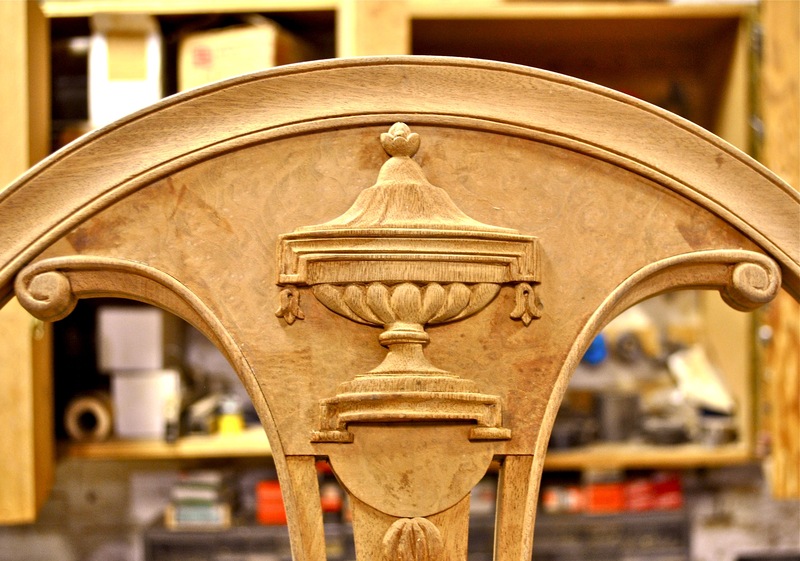 Do you consider woodwork an art form? That’s a good question. I’ve never considered it “art”. 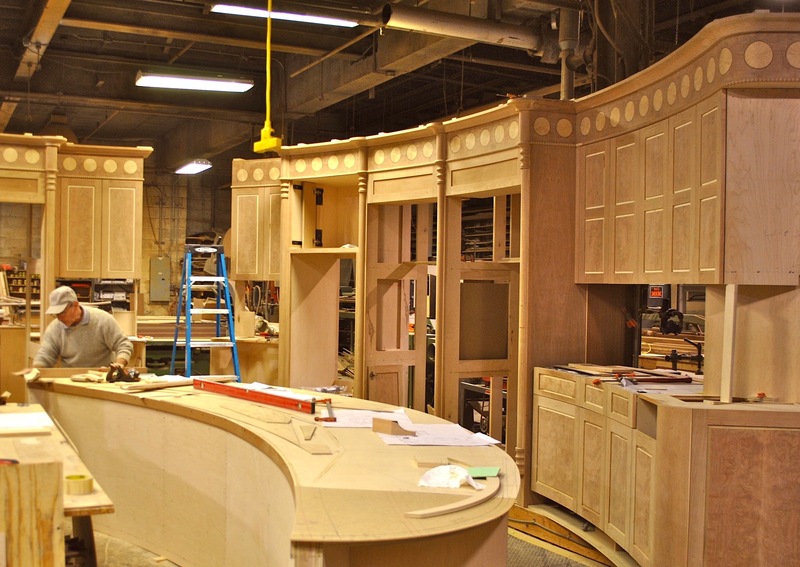 Cabinetmaking is a level of skill, a trade, and a craft. It’s not art in the sense that it’s functional. Art, in my opinion, is something that someone appreciates just for what it is, but it serves no real purpose. You don’t need a painting. You don’t need a sculpture. You just admire it, and you admire the skill of the artist, the concept, or just the sheer beauty. I like the ancient Roman word, “artisan”. Artisans were artists, but they also produced things that were necessary, functional, and which could also be admired. Roman plumbers were considered artisans. It took a high degree of skill, especially back then. It didn’t necessarily have to be beautiful, but it had to work. So there’re artisans and then there’re artists. Artists are also different from craftsmen because their work tells a story and incites emotion. The work of Bernini, one of my favorite artists, makes my hair stand up. But what he did was for the sole purpose of telling a story. What is the most unusual request you’ve had from a customer? Someone once asked us to make wooden toilet seats. We were doing a big job in their house with mahogany paneling, and they wanted mahogany toilet seats specifically. We used polyurethane waterproof finish to prevent any serious splinters. That was a strange request. How have you seen Kensington change over time? It’s a good area to come back alive again. Fishtown and Kensington never really went bad, in that they didn’t deteriorate like other parts of Philadelphia. They stayed working class neighborhoods. Girard and Frankford Avenues were nice avenues at one time, and they’re becoming nice avenues now. Years and years ago this neighborhood was all working class people, and there were all these factories. My mother worked in the knitting factories here until 1960, and was part of the International Ladies’ Garment Workers’ Union. People would come home from work, pick up their kids after school, and get ice cream. Front Street and Kensington Avenue were jumping. It was thriving just before the war. Then in the 50’s businesses started moving out, and the neighborhood changed. The industry couldn’t keep up with new regulations. The steel industry in Pennsylvania left because of the pollution, and the cost it would take to get their factories up-to-date. So we ended up having a lot of dilapidated, backwards factories here. Manufacturers left, and the economy slowly went down. Things like that happened in this country at the time. When I bought this building 17 years ago, Kensington wasn’t as nice as it is now. There wasn’t a nice coffee shop on the corner or a high school. All that’s changed, and I like the way everything’s headed. For more information visit the Rossi Brothers website. This entry was posted in Categories, Shops & Services and tagged fishtown, furniture design, Kensington, philadelphia, philly, rossi brothers, rossi brothers cabinet makers, victor rossi, woodwork by fishtownspotlights. Bookmark the permalink.